The Battle of El Mughar Ridge on 13 November 1917 took place at Junction Station, where the Haifa-Jerusalem line branches to Beersheba. The battle succeeded in causing the Ottoman Seventh and Eighth Armies to withdraw towards Jerusalem and Haifa respectively. Friedrich Freiherr Kreß von Kressenstein (April 24, 1870 - October 16, 1948) was a German General from Nuremberg. 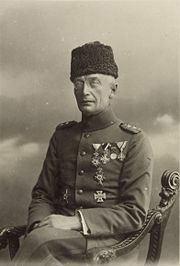 He was a member of the group of German officers who assisted in the direction of the Ottoman Army during World War I.